Balerna, 13th September 2018 – APR Applied Pharma Research s.a. (“APR”), the Swiss independent developer of science driven and patent protected healthcare products, has successfully concluded its participation at the recent SSIEM (Society for the Study of Inborn Errors of Metabolism) Conference held in Athens. The company has taken advantage of this international event, gathering around 3.000 physicians involved in inherited metabolic diseases, to showcase PKU GOLIKE®, the innovative Phenylalanine (Phe)-free medical food formula for Phenylketonuria (PKU), powered by the patented Physiomimic Technology™. Throughout the lifetime of the event, APR’s staff has been very busy at the company booth with welcoming a high number of physicians from all over the world eager to gather more information about PKU GOLIKE®. Visitors’ questions regarded, in particular, the patented PhysiomimicTM Technology – how it works and the benefits of its application to the innovative amino acids mixture. 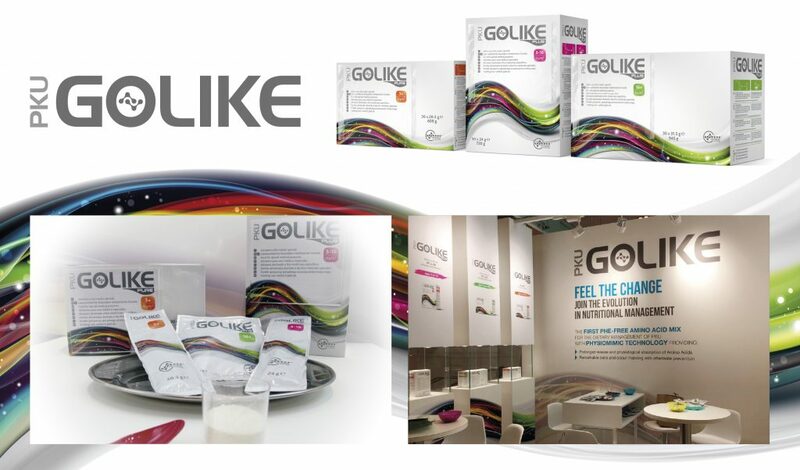 They also had the chance to get to know PKU GOLIKE® range, made of three different AA mixes suitable for PKU patients of different ages, as well as to experience the special coating micro granules containing the exclusive formulation of AAs. Physicians and dieticians who tasted the product were extremely surprised to find out how the Physiomimic Technology™ is actually able to remarkably mask the unpleasant taste and odor of AAs, thus being confirmed on the extent of this significant advantage for PKU patients’ compliance to dietary regimen. Phenylketonuria or PKU is a rare, genetic, recessive metabolic disorder affecting about 50.000 people worldwide. PKU is characterized by the deficiency or the malfunctioning of a liver enzyme needed to process phenylalanine (“Phe”), an essential amino acid found in most protein-containing food. Excessive amounts of Phe in the bloodstream become toxic to the brain, impairing the normal development of the central nervous system. If not properly treated, PKU leads to severe, non- recoverable mental retardation and major cognitive disabilities. PKU can only be treated through a strict, life-long, low-protein (low-Phe) dietetic treatment combined with a daily assumption of low- protein modified foods and medical food, which provides Phe-free amino acids and other important nutrients, needed due to the dietary restrictions of PKU patients. APR is a Swiss, independent developer of science driven, patent protected healthcare products. The Company identifies, develops and licenses, value added products designed to address patient or consumer needs in niche or rare therapeutic areas on a global basis. In particular, APR’s business model is currently focused on two pillars: (i) internally developed and financed (alone or together with co- development partners) proprietary, value added products to be licensed to healthcare companies for their commercialization, and (ii) support to third party projects by offering added value R&D services under contract and fee for service arrangements. APR has a balanced pipeline of revenue generating branded products marketed in all major markets, combined with a compelling pipeline of products at different stages of development. APR has entered into licensing and partnership agreements with pharmaceutical companies in over 70 countries, with international sales on a worldwide basis.